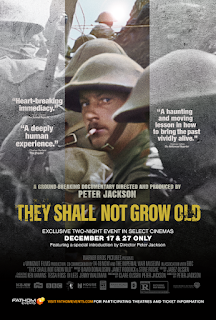 They Shall Not Grow Old is rereleased in theaters on February 1st, 2019. They Shall Not Grow Old comes a little over one hundred years after the end of World War I. It uses a mix of never seen before footage and the first hand stories from British soldiers during their battle in the frontlines of Belgium. Can this documentary deliver something new about the past? This documentary was like nothing I have seen before. Instead of using re-enactments and a single narrator, it utilizes parts of interviews from British soldiers who lived it. Hearing the haunting yet in depth memories of the soldiers tells an immersive story. It delves into the story from the young men signing up to join the military to the end of the war including life shortly after and all that you can possibly think of in between. I was even more so intrigued because of the technology the director used to further tell the stories in a different way. Most of it was digitally remastered and came to life which gave the stories even more depth like nothing I was expecting. Most of them were just boys at the time and seeing them in color gives a more realistic view rather than the black and white photographs that I am used to seeing. It is a documentary about war so it is gruesome and gory in several parts but if you enjoy learning about the history of the world and its past wars then I truly recommend you watch this film. Also stick around after the credits for extra footage of how the film was made by the director.